In many randomised trials researchers measure a continuous variable at baseline and again as an outcome assessed at follow up. Baseline measurements are common in trials of chronic conditions where researchers want to see whether a treatment can reduce pre-existing levels of pain, anxiety, hypertension, and the like. Statistical comparisons in such trials can be made in several ways. Comparison of follow up (post-treatment) scores will give a result such as “at the end of the trial, mean pain scores were 15 mm (95% confidence interval 10 to 20 mm) lower in the treatment group.” Alternatively a change score can be calculated by subtracting the follow up score from the baseline score, leading to a statement such as “pain reductions were 20 mm (16 to 24 mm) greater on treatment than control.” If the average baseline scores are the same in each group the estimated treatment effect will be the same using these two simple approaches. If the treatment is effective the statistical significance of the treatment effect by the two methods will depend on the correlation between baseline and follow up scores. If the correlation is low using the change score will add variation and the follow up score is more likely to show a significant result. Conversely, if the correlation is high using only the follow up score will lose information and the change score is more likely to be significant. It is incorrect, however, to choose whichever analysis gives a more significant finding. The method of analysis should be specified in the trial protocol. where a and b are estimated coefficients and group is a binary variable coded 1 for treatment and 0 for control. The coefficient b is the effect of interest—the estimated difference between the two treatment groups. In effect an analysis of covariance adjusts each patient's follow up score for his or her baseline score, but has the advantage of being unaffected by baseline differences. If, by chance, baseline scores are worse in the treatment group, the treatment effect will be underestimated by a follow up score analysis and overestimated by looking at change scores (because of regression to the mean). By contrast, analysis of covariance gives the same answer whether or not there is baseline imbalance. (see figure). The coefficient for group (b) has a useful interpretation: it is the difference between the mean change scores of each group. In the above example it can be interpreted as “pain and function score improved by an estimated 12.7 points more on average in the treatment group than in the control group.” A 95% confidence interval and P value can also be calculated for b (see table).5 The regression equation provides a means of prediction: a patient with a baseline score of 50, for example, would be predicted to have a follow up score of 72.2 on treatment and 59.5 on control. An additional advantage of analysis of covariance is that it generally has greater statistical power to detect a treatment effect than the other methods.6 For example, a trial with a correlation between baseline and follow up scores of 0.6 that required 85 patients for analysis of follow up scores, would require 68 for a change score analysis but only 54 for analysis of covariance. The efficiency gains of analysis of covariance compared with a change score are low when there is a high correlation (say r>0.8) between baseline and follow up measurements. This will often be the case, particularly in stable chronic conditions such as obesity. In these situations, analysis of change scores can be a reasonable alternative, particularly if restricted randomisation is used to ensure baseline comparability between groups.7 Analysis of covariance is the preferred general approach, however. As with all analyses of continuous data, the use of analysis of covariance depends on some assumptions that need to be tested. In particular, data transformation, such as taking logarithms, may be indicated.8 Lastly, analysis of covariance is a type of multiple regression and can be seen as a special type of adjusted analysis. The analysis can thus be expanded to include additional prognostic variables (not necessarily continuous), such as age and diagnostic group. We thank Dr J Kleinhenz for supplying the raw data from his study. .Regression towards the mean.BMJ1994;308: 1499. .Some examples of regression towards the mean.BMJ1994;309: 780. .Baseline comparisons in randomized clinical trials.Stat Med1991;10:1157–1159. 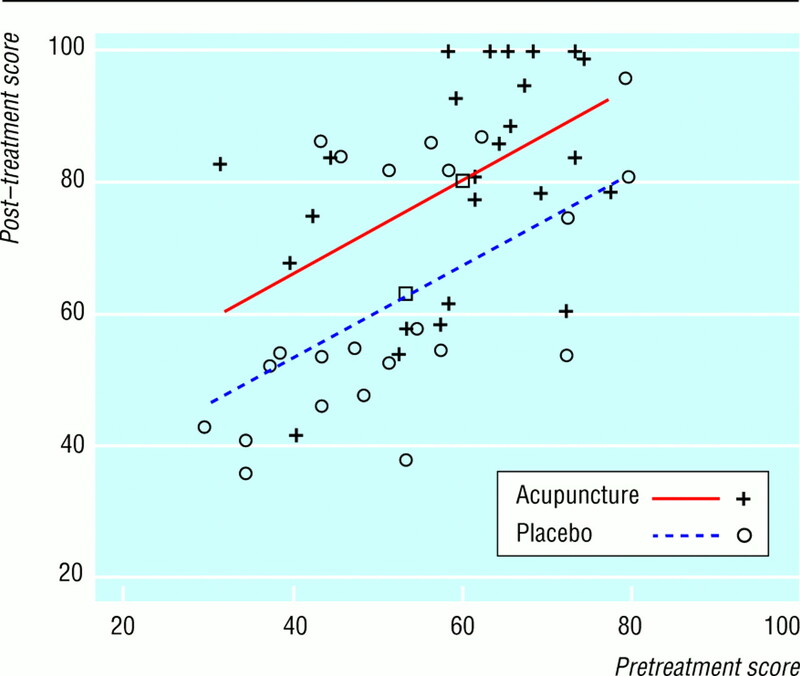 .Randomised clinical trial comparing the effects of acupuncture and a newly designed placebo needle in rotator cuff tendonitis.Pain1999;83:235–241. .Regression and correlation. In: Altman DG, Machin D, Bryant TN, Gardner MJ eds.Statistics with confidence.2nd ed.London: BMJ Books,2000:73–92. .The use of percentage change from baseline as an outcome in a controlled trial is statistically inefficient: a simulation study.BMC Med Res Methodol2001;1: 16. .The use of transformation when comparing two means.BMJ1996;312: 1153.